First off, I’d like to give a big thanks to JA Konrath for giving me this opportunity. I gave his novels a shot one day and found not only a treasure chest of entertaining stories, but a prose style that yanked my eyes across the page without breaking a sweat. That kind of craftsmanship is what I strive for in my own work. However, when I started publishing—like your typical newbie—I ignored one of the most important lessons one can learn from an author like Konrath, who has built an impressive following around his work. And this mistake cost me a lot of money, too. 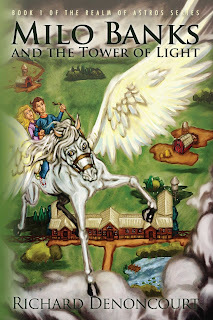 Around $2000, actually, which is what I paid a well-known service to construct what I thought was the ideal cover for my book, Milo Banks and the Tower of Light. Let’s rewind a little. Take a look at JA Konrath’s book covers. You know which of his novels are horror (see AFRAID), which are pure suspense (see TRAPPED), and which provide a mystery with a heavy dose of comedy (see WHISKEY SOUR). This is how covers should look. Hell, I even hired his cover designer, Carl Graves, to do three of my own books. But I had to learn from my rookie mistake first. Here’s what happened. 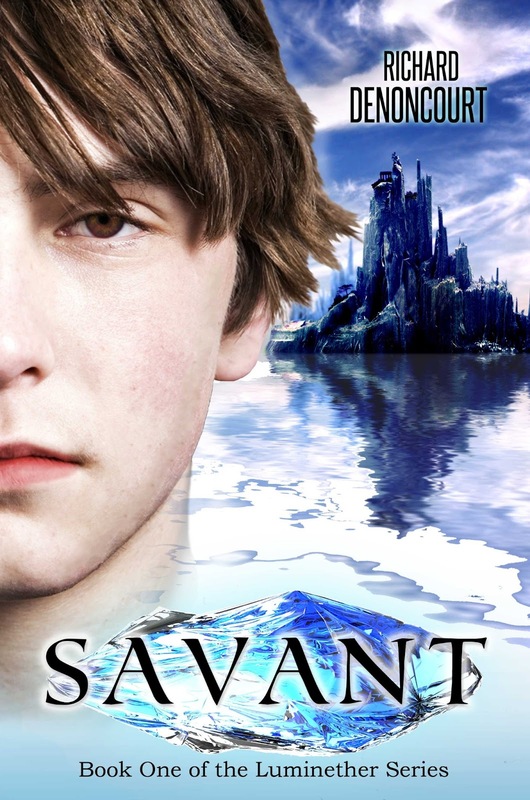 I released a fantasy novel meant for teenagers aged 12 to 16. It’s about two 14-year-old kids (a twin brother and sister) who discover that their family is descended from ancient gods. The novel takes them into a world where those same gods—before disappearing off the planet—left behind four races of people based on humans. Because of the existence of these four races (Acolytes, Savants, Sargonauts, and Ferals) the book encounters themes of racism and genocide, and the villain is a Hitler-esque figure who believes that Ferals (people with orange eyes, tails, and the ability to “phase” into animals) must be eliminated in order for him to maintain control over his empire. 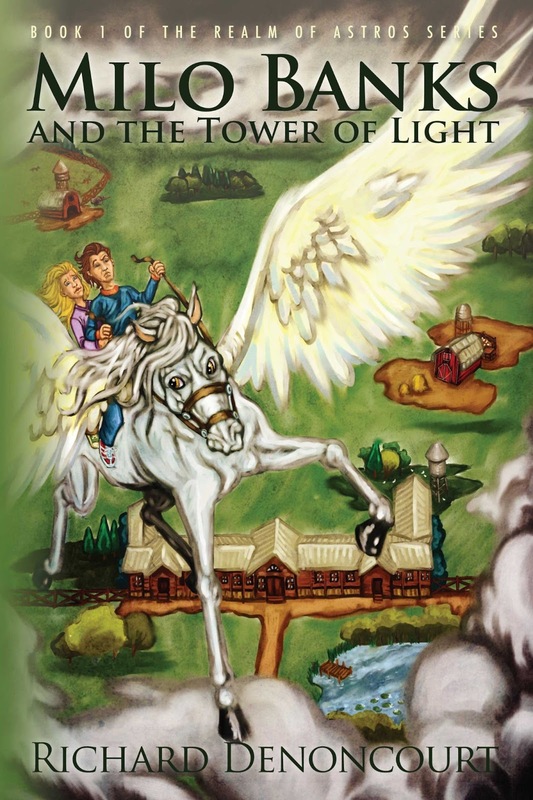 I paid a service to create a brightly colored cover with two kids riding a winged horse into the sky. I titled the story “Milo Banks and the Tower of Light.” It’s a long, awkward title, but at the time, Harry Potter and Percy Jackson were doing extremely well. Amateur, right? The cover, as you can see, targeted a “middle grade” audience of children around the age of 10. This was flat out wrong. The book deals with heavy sociopolitical themes and contains images of violence way too intense for kids of that age. I realized this only after paying that $2000 (and the artist did a great job, no question there), and after seeing sales remain flat. Since then, I’ve retitled the novel to “Savant,” which is short, sweet, and relevant to the main character’s situation (Milo discovers he is a Savant—a member of a race capable of wielding powerful magical spells). The new cover design, which I did myself, shows a kid who appears to be around 14 (the average age of the reader I’m targeting), and it shows him with a serious look on his face. It’s brightly colored, but without looking pastoral and gaudy. You can tell by looking at it that the book has fantastical elements, but the kid’s expression—and the castle in the background—are more mature and serious while retaining that promise of otherworldly adventure. And you know what? It only cost about $100 in photo licensing fees to make. Ultimately, a good book cover is not about the money spent or saved, but about the message. When the eyes of potential readers begin landing on your book cover—the first thing they’ll see—what impression will they take away from it? In this case, they see a book suitable for teenagers, not little kids, which makes sense considering the nature of the story. The result? Sales have quadrupled with this new release, and they get stronger by the day. So you tell me. Does the new cover succeed? What has your experience been with paying for cover designs and branding your story? Do you feel your book covers accurately reflect the nature of the story you’re trying to tell? Those of you who would like to read Savant can do so for free. Just go to my blog, Self Land Stories,and sign up to receive blog post updates, or sign up for my newsletter. I’ll email you Savant as an .epub that you can load directly into your e-reader. When you’re done, leave a review and let me know what you thought! Thank you, indie authors and readers, and keep those books coming! 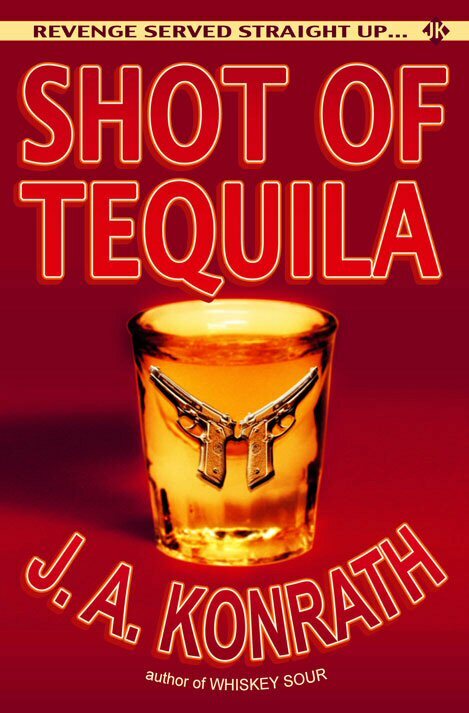 I wrote a book in 1997 called SHOT OF TEQUILA. I hadn't yet gotten an agent, and when this one made the rounds I had a few agents call me up and tell me they liked it, but couldn't sell it. Tequila, see, was written as an homage to the pulps. Tough guy, hardboiled, Chicago mob noir, with lots of violence. A genre that, in 1997, wasn't selling according to agents. So I was told to write something more commercial. I went on to write ORIGIN and THE LIST, neither of which sold, and then WHISKEY SOUR, which did. 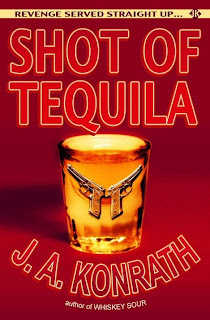 When the Kindle opened up to self-publishing in 2009, I put ORIGIN and THE LIST up for sale, and reworked SHOT OF TEQUILA to tie it into my Jack Daniels series, then put that up for sale as well. I asked Carl Graves to do a retro Robert McGinnis type of pulp cover. And I liked his end result, which he hand drew for me. Well, THE LIST and ORIGIN sold pretty well. But TEQUILA didn't sell at all. 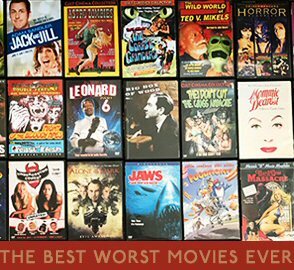 I'm talking 1/10 of the sales of THE LIST and ORIGIN. It was getting good reviews, and people liked it, but I couldn't figure out why it wasn't selling. Once I changed the cover, sales quadrupled, and in three years I've made $65,000 off a book that NY assured me no one wanted. So let me talk for a bit about some of the things I like to see in a cover, both as a reader and as a writer, and why I think so many self-pubbed covers are lacking. 1. Can it be read as a thumbnail size in grayscale? Always make sure your cover artist gives you an example of your cover as small and gray, because that's how many readers will see it on e-ink devices. Your name and title should be able to be read while small and gray. 2. Does it convey genre? Both of these covers for Tequila show it's a crime thriller. But the first one looked old fashioned, the new one looks current and hip. 3. Are there words on the cover? Look at some Big 5 covers. Besides the title and author name, there are usually other words. Blurbs from other authors, or reviews from well-known publications. Taglines. "Author of XYZ". Etc. Adding a tagline, review, or "author of" is a subtle cue that makes readers subconsciously think this was released by a major publisher. 4. I'm not an artist, so I'm not one to speak about the rule of thirds, vectors, color schemes, hue and chroma, negative space, blending, light and shadow, or many of the other things a pro is aware of. But when I first started self-pubbing, I could tell the Big 6 covers from newbie covers at about a 95% accuracy just by glancing at them. This has become more difficult as the years have passed, as more and more writers are realizing the importance of professional covers. But I still see covers all the time that make me cringe. 5. Branding. Having multiple books with a similar style or theme (my Jack Daniels series, Jack Kilborn books, Timecaster books, Codename: Chandler books) help readers identify you and your titles. The author is the brand. The covers can reflect that. 6. Get a second opinion. I was wrong about the first Tequila cover. I liked it, and didn't care what anyone else said about it (I had peers I trusted who didn't like it), and it hurt my sales. Now I listen to peers. An even smarter move is to crowdsource opinion like Marcus Sakey just did. 7. Don't be afraid to change. One of the advantages indies have is our ability to experiment. If sales aren't where you want them, a new cover may be something that can goose them. Asking friends and family isn't going to get you an honest answer, unless friends and family are professionals and don't mind hurting your feelings. Readers do judge books by their covers. If you aren't open to the fact that your cover may not be working, you aren't doing yourself any favors.